The Samuel H. Abramson Memorial Research Fellowship (Abramson Fellowship) at Harvard University was established in 1983 by Edward and Harriet Abramson in honor of Edward’s father to support students conducting research on issues related to Israel and Jewish studies. However, when Edward passed away in 2001 after a courageous battle with ALS, the focus of the fellowship shifted to support students conducting stem cell research particularly in the areas of ALS and neurodegenerative disease. Thank you to Prize4Life supporter and ALS advocate Harriet Abramson, as well as Dr. Jeffrey Macklis, Professor of Stem Cell and Regenerative Biology at Harvard University and mentor to many of the students that receive the Abramson Fellowship, for the opportunity to get to know some of the most recent recipients of the Abramson Fellowship. Harvard University senior and Abramson Fellowship awardee Christopher Devine grew up just outside of New York City in Ramsey, New Jersey. Before beginning his studies at Harvard in the fall of 2009, Christopher attended high school at Bergen County Academies (BCA) where he chose to specifically focus on medical science technology. While at BCA, Christopher honed his leadership and communication skills. These skills have matured and continue to serve him well with his studies and scientific research efforts at Harvard. 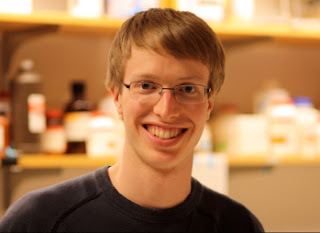 We recently asked Christopher to share his thoughts about being awarded an Abramson Fellowship in the summer of 2012 and how his research at Harvard may impact the understanding of neurodegenerative diseases such as ALS. A: Research in the Macklis lab is at the forefront of developmental and regenerative biology. I am currently working with postdoctoral fellow Dr. Hari Padmanabhan to better understand neuronal development and regeneration. More specifically, I work with a unique species of salamander that can naturally regenerate its body parts, including the spinal cord and brain. If we are able to better understand the mechanisms involved with brain regeneration and repair, it will bring us one step closer to understanding the complexity of neurodegenerative diseases like ALS. Q: Why did you choose to focus your research on understanding neuronal regeneration and neurodegenerative diseases? A: Of all known medical conditions, neurodegenerative diseases are by far the least understood. The fact that so little is known about neurodegenerative diseases, and in particular ALS, has served as a powerful motivator for me to engage in basic scientific research focused on the development and regeneration of the central nervous system. It is important for me know that my research, no matter how small the contribution is, may in fact contribute to the fight against ALS and possibly provide hope to those who are currently battling the disease or will be diagnosed in the future. A: Being awarded an Abramson Fellowship has empowered me to become involved with understanding how to translate basic research findings into discoveries that can one day help treat patients with neurodegenerative diseases. I have shadowed neurologists and have seen how debilitating neurodegenerative diseases such as ALS and Parkinson’s disease can be to patients and their loved-ones. These diseases can strike anyone regardless of who you are, where you come from, or what you have done with your life. Not only is the research I am conducting intellectually stimulating, it reminds me that I am making a difference for ALS patients. I am truly lucky to be participating in cutting edge research that will contribute to a better understanding of the cellular mechanisms that drive neuron development and repair. A: My long term goal is to help those who suffer from neurodegenerative diseases as a physician-scientist. This will allow me to engage in both medical practice and in translational research. I am confident that the foundation I have built at Harvard will help me to achieve this goal. Following graduation this May, I will be attending the University of Cambridge in the United Kingdom to pursue my MPhil in Translational Medicine and Therapeutics as well as continue to develop my skills in translational research. After that, I plan to return to Harvard Medical School and then eventually practice medicine with the hope of using translational research to take potential therapies from the bench to the bedside. A: Conducting innovative research and working together is what I believe will lead to effective treatments and a cure for ALS and other neurodegenerative diseases. And it is not just the work I am conducting in the Macklis lab as an Abramson Fellowship awardee; it is the work of other Abramson Fellowship awardees, undergrads, graduate students, post docs, and researchers around the world as well who are studying basic biology and making new scientific discoveries to advance our understanding of neurodegeneration. I would like to express my appreciation to the ALS community for being so supportive and passionate. This is incredibly meaningful to students like myself and keeps us motivated to continue pursuing scientific research that contributes to the fight against ALS. I want to say to the ALS community and the supporters of the Abramson Fellowship, thank you for allowing young researchers like me to be involved in such an important mission.